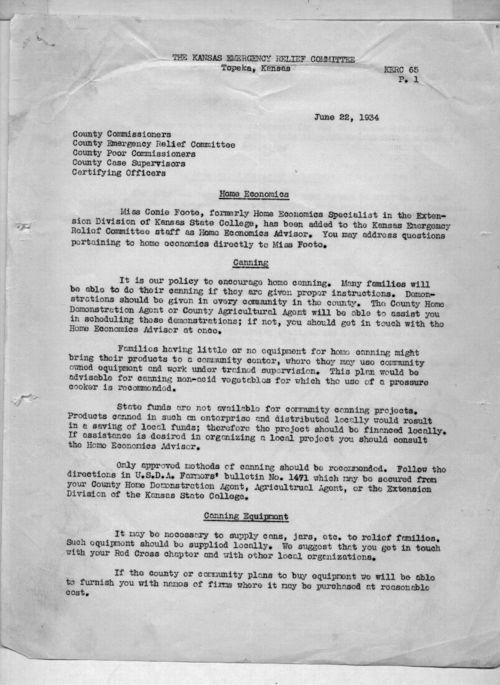 This bulletin, signed by John G. Stutz, executive director of the Kansas Emergency Relief Committee, describes their policy of encouraging home canning as part of a larger home economics project. In order to help families make the most out of their food supplies, the committee hired a Home Economics Specialist named Conie Foote to teach housewives about canning. Assistance would be provided for families on relief. This source demonstrates how women contributed to their family's welfare by making the most out of their food budgets, thus illustrated the personal experiences of women during the Great Depression and Dust Bowl. It could be grouped with other sources about the KERC and relief efforts, particularly the photo of canning kitchens in Wichita.